<hand over eyes> Yes. Definitely need a better name. ^_^ As Ecclesiastes 1:9 put it, "What has been is what will be, and what has been done is what will be done; and there is nothing new under the sun." Koholeth was a smart guy. In addition to the Witness and Blackjack, Ferroburg has also recently seen the arrival of a small team of armored vigilantes who have begun taking action against criminals in the area. Unlike the former pair, however, these 'Angels' are definitely known to exist, as they have accepted bounties for recapturing fugitives from justice. It is also rumored that they accept contracts as 'heroes for hire', though no official means of contacting them has ever been revealed. Unfortunately, it must also be admitted that their activities have caused a great deal of property damage, and while the Angels have not yet been charged with any offenses, the possibility that they should be is under investigation. Also under investigation is the question of how they acquired what appear to be lower-powered versions of the nanotech battle armor employed by Robin 'Songbird' Greyfaulks, one of the major stockholders of Delta Media. The answer, of course, is that, just like her, they stole it. Technically, the founder of the team stole the other suit of armor created by the suit's original manufacturer, which was then re-engineered by her partner in crime to build five less powerful suits. They have each been given to individuals recruited to serve as members of the team, with the understanding that membership in the group is for life, since they cannot be removed from the person using it until after the suit returns to an inactive form following the death of the wearer. There are currently only four members of the team ... three others have been members, but the missions undertaken by the Angels are dangerous. Which explains what happened to one-third of the former members. Motivation-Varies: Each of the team has their own particular motivation. and the process destroys whatever clothing they were wearing. 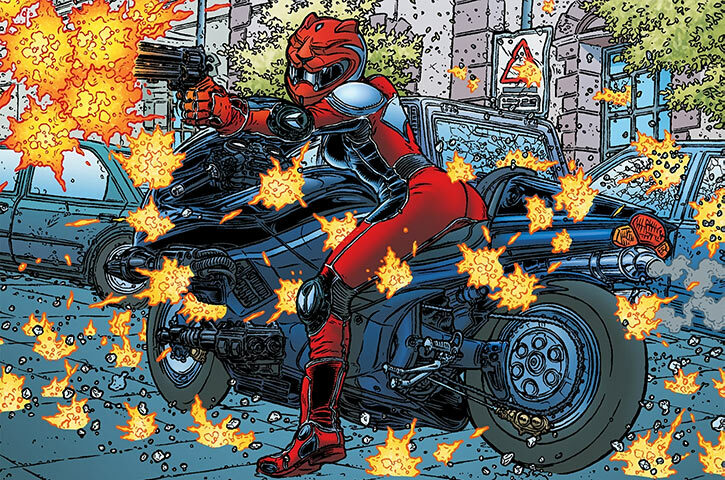 Diana Mallory, the most senior member of the current team, has Str 1, Fgt 3, Equipment 4 (heavy motorcycle), and carries a Bell-Francis Governor firearm (Ranged Damage 8, Inaccurate) in addition to the arnaments of her powersuit. Her motivation is Mercenary -- while loyal to the team, her primary interest is in surviving long enough to get paid for the jobs they undertake, rather than any higher aspirations. Convincing her that there's more to life than that might be a worthwhile cause. Gladys Michelle, the next most senior recruit, has Technology 6 (+8) and a small array of Tech Powers (beginning with Comprehend Machines 2 & Communication (radio) 1). Her motivation is Thrill of Adventure -- despite the danger she's constantly in, she's having a wonderful time and finds the entire experience a much better adrenaline rush than any of the other dangerous things that she's tried. She is also the only member of the team who is not biologically female. Stephanie Benjamin, the most recent recruit, is statistically described above. Her motivation is Stunned Disbelief That She Has Been Recruited Into A Crimefighting Team And Can Only Leave The Team Feet-First. Okay, it's actually Unwanted Power. She's not a happy person, is Stephanie. And then there's Dr. Sue Evil ("It's 'Ih-vil'. 'Ih-vil') who has many secrets. Like, she's not from around here. And, she's much older than she looks. And, she's actually a fallen member of the original Heralds of Legend who is determined that (a) the Heralds reborn on Earth will not wreck this world too and (b) a group of locals who have access to a technology much like that which created the Heralds in the first place will not misuse it. Her determination and dedication would be admirable, if she wasn't a dirty old man who's neither visibly old nor male. Last edited by Davies; 11-06-2017 at 03:54 PM. Incidentally, the Herald that Dr. Sue (let's call her) used to be, before she tore it out of herself, damaging it quite a bit, has reincarnated on Earth. In Japan. 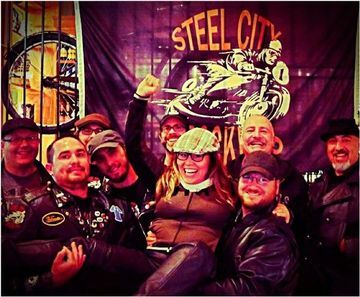 Honestly, there are very few things that Pittsburgh hasn't applied "Steel City" to. It's a peril of the area. The Angels march in various parades in the area, and I know one of the girls through local theater and films. I will cease teasing you about such coincidences.